A dog can have matted hair anywhere on its coat, but the following are the most common areas where matting occurs. Grooming! Grooming! Grooming! Regular baths, brush outs and trimming are the best ways to prevent mats. In addition, if your dog is a longer coated breed you must thoroughly brush him/her before and after the bath. Do not bath your dog without brushing. Always dry your dog thoroughly (down to the skin) after a bath. A wet coat tightens the fur, which is why it’s important to dry your dog as thoroughly as possible to prevent matting. Maintain a regular brushing and combing schedule, preferably a few times a week. When brushing your dog, make sure to use a stainless steel metal comb. Use the comb to brush down to the skin to catch any buried mats as they start to occur. The ones near the skin can’t be seen, so they are often overlooked. Brush around the mats to loosen up the coat. This also gets rid of any dead hair that may be present. Cornstarch is a great de-matting aid. Rubbing a pinch or two onto the mat should help do the trick. Comb the matted area(s) with a stainless steel metal comb in one direction, repeat as necessary until the mat has returned to strands of hair. In some cases, trying to brush the mat out is painful for your dog, and cutting it out is the only pain-free option. Matted hair is not just uncomfortable and unsightly it is also dangerous. Matted hair can trap fleas, ticks, dirt, bacteria and more. Mats also pull on your dog’s skin, causing discomfort, pain, or even sores if they are left long enough. 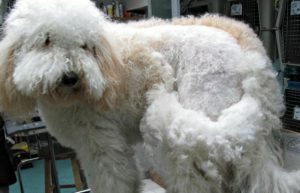 If your dog is in need of some de-matting treatment, please stop by and talk to one of our experienced groomers!